Can You Tell Me How This Border is Constructed? Thread: Can You Tell Me How This Border is Constructed? I am wanting to make a quilt in the same pattern as the one featured on this page at the very bottom left side (white, lt blue and dark blue). I can't make out what the borders look like exactly so I can't tell what parts there are. Can anyone figure it out? It's such a tiny image. I tried downloading the image and enlarging it, but it wasn't any clearer! Is there any way you could contact the owner of the quilter community website for help? It says that it was designed in EQ5 and I have it in EQ7 as well. Do you know anyone with this software? I don't know how to post it here. Hopefully someone who is a bit more computer literate with one of the EQ programs could help? This is how it looks like to me. What EasyPeezy posted is what it looks like to me. It's a half-square light blue triangle with a quarter-square white-and-blue triangle together. So you'd make an HST of white and blue, then make another HST with a square of light blue. woody, I just got EQ7 a few weeks ago. I went through the tutorial videos but a week later was lost trying to design something. Is there a section that has already designed quilts in the program?? Did you find this exact quilt (with the featured border)? If so, can you let me know how I can find it? Thanks. Easy Peezy, thanks for the image. That is what I am just making out myself. There are pre-designed blocks in the library, and pre-designed borders as well. For a border, click on layout, then add a border. You can choose from several pre-made borders and adjust the size to get what you want. Pretty sure that border is in "The Border Workbook". If so, the book will give clear instructions for the math to make it fit your quilt. I'm not at home or I'd check. 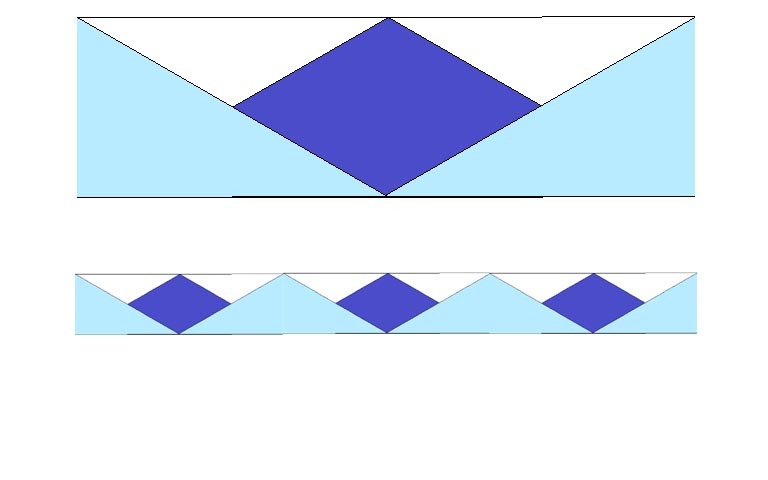 It can be made with Quarter square triangles with one half solid light blue and the other side half white and half dark blue. It can be seen by drawing a vertical line from each point down and then "seeing" the squares. All in color placement. I would not mind the extra sewing since it is an easy construction. I can see it as the 5 minute block or tall/skinny 10 minute block. Use the light blue on one side and the white on the other with the dark blue as the center. Then do the roll back and stitch to form the curve. It looks to be a 60 degree diamond split in half lengthwise. Last edited by bearisgray; 11-23-2012 at 09:08 AM. Isn't this Jacobs ladder. Sure looks it to me and is the easiest square to do. I made a lap quilt in all the same square but different shade of beige, cream and other fall colors. Love it. After looking at this through a magnifying strip I think it is a square and x's I will attemp to attach a picture.Well I can't figure out how to post a picture. Can anyone help? 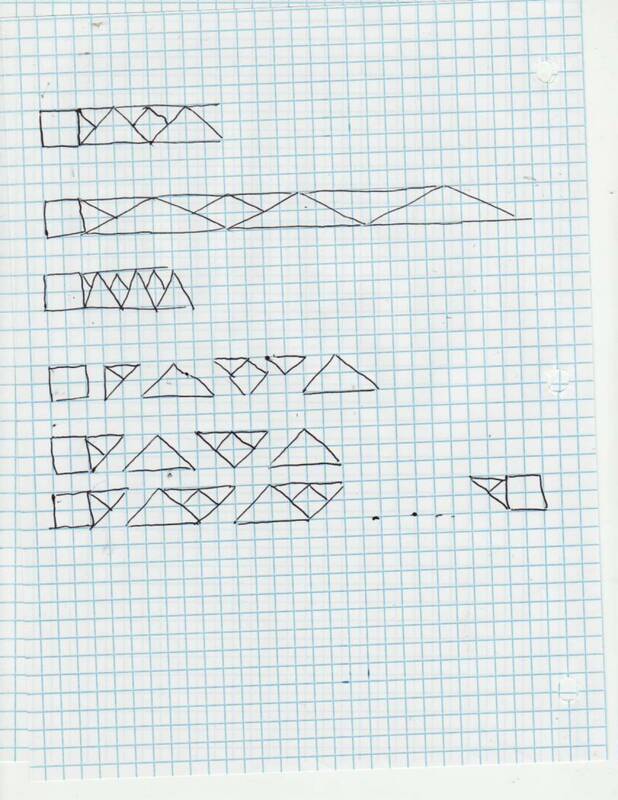 If you take a sheet of graph paper and draw a square and then turn it on a diagonal, draw a straight line from the top of the square through the centers of the next few squars, you will have the edge of your border. Then do the same for the bottom of th square. then draw an x along side it another square and another x. I think you will end up with needing a 1/2 square triangle in the top and bottom of the x. Sorry I can't get the picture in but I do not see a "tree" anywhere to click on. Last edited by gmcsewer; 11-23-2012 at 12:13 PM.
. 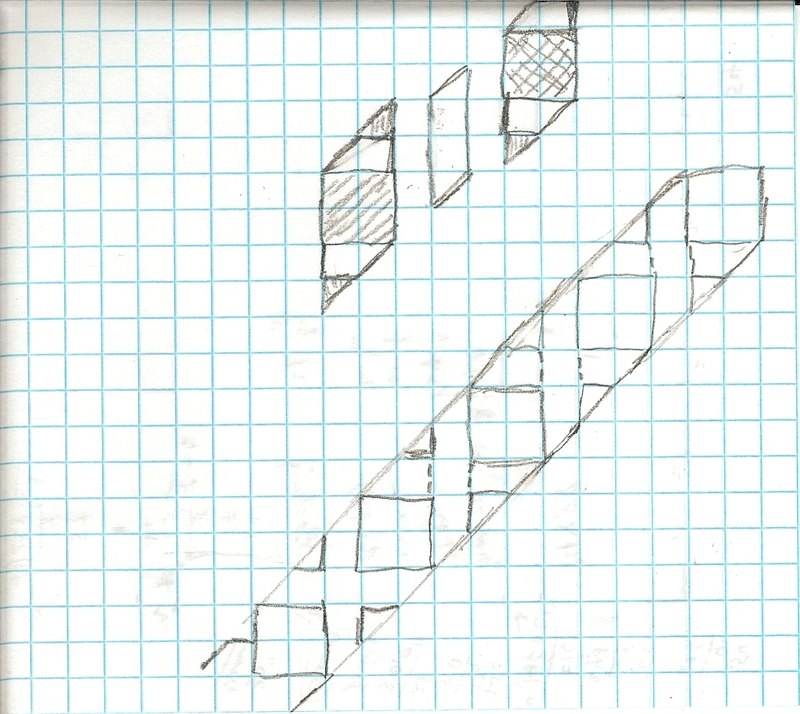 This is the drawing I did with the graph paper. Hope you can see it. If need a better drawing, let me know and I will try to do it in colored pens or something. On some screens/computers, one can enlarge the image by holding the control key and the plus key at the same time. I agree with easypeesy, I think it is done with the squares and half square triangles, rather than the diamonds. 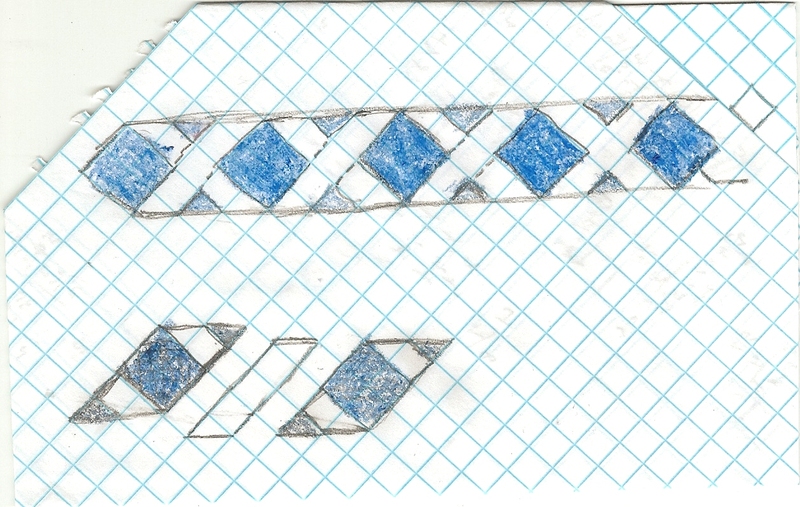 When it is sketched on the graph paper this way, it looks more like what shows in the photo. This would be half of the Jacob's Ladder, yes. I do like this border, it looks very nice! Here I am again with a better drawing. I think this is the design if you look closely with a magnifying sheet held up to the screen. I see we are working on two different borders, LOL. I was getting confused. I was looking at the border on the quilt on the bottom left, but there is also a border along the left side of the entire page. Now I wonder which one is the one of actual interest. wildyard, that is so funny. I didn't even notice the boder motif that runs down the left side of the page. No, I am talking about the outter border on the quilt that is at the bottom left side of the screen. It definately looks like the image that catmcclure posted but I think to construct it, the method that easypeesy posted using HST would work best. I'm still in the planning phase so I have plenty of time to work through but I will need to purchase more fabric to have enough for the borders so I'll need to do that soon. Thanks everyone. p.s. I tried to reach the lady listed at the top that posted the quilt and idea but her link to her studio webpage doesn't work anymore. Interestingly, she is listed as living in Woodburn, Oregon which is close to where I was born and raised before moving to Califorina. She hasn't posted there for a large number of year. I hope she didn't pass away.